We all know about TWITTER, which is one of the top and best social networking site. Twitter is mostly used by the business persons, celebrities, players, companies, internet marketers and even most of civilians has their account on twitter to get in touch with their followers and get the latest trending news. On the other hand, people do share their thoughts with their followers through twitter. I think it doesn't need any introduction because you must be aware of what twitter actually is? Here we will be going straight to the instructions and steps involved in case you want to remove your twitter account. Well, so look at the below steps and follow the instructions given in order to delete your twitter account permanently. Step-1: First of all, visit twitter.com and login to your account which you want to disable. Step-2: Now at the right top of the page, click on Gear icon and select settings from the drop-down menu. Step-3: The settings page will be loaded, now scroll down to the bottom of the page. At last, you see a link i.e Deactivate My Account. So click on this link and proceed further as below. Step-4: After clicking on that link, a new page loads which has some important statements to read. At the end you see a button like Deactivate @username. 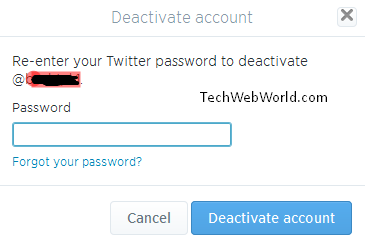 So click on that button to deactivate your twitter profile. Step-5: As you click on that button, a window pop-ups asking you to enter your password for security reason. so enter the password and click on deactivate button. That's it. Your account will be deleted in next few seconds but some data may still be available on twitter which stays only for few days. When you delete the twitter account, it only retains your data, your account can still be reactivated in next 30 days. If you didn't reactivated your twitter account your account on twitter will be deleted permanently. 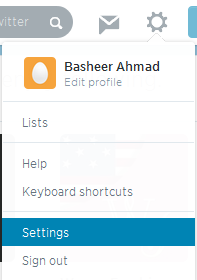 Make sure that you may not be able in future to create new account with the same email or username on twitter. So if you're planning to create new twitter account later on the same email then you just change your twitter username. The deleted twitter account removes but some contents stays there just for few days which is veiwable only for few days and then deletes after few days permanently. Twitter says that we have no control on content that are indexed by the search engines like google or bing etc. So dear readers, in this post, we shared a how-to guide that is to delete your twitter account permanently. I hope the post was helpful for you and you understand the steps very well.